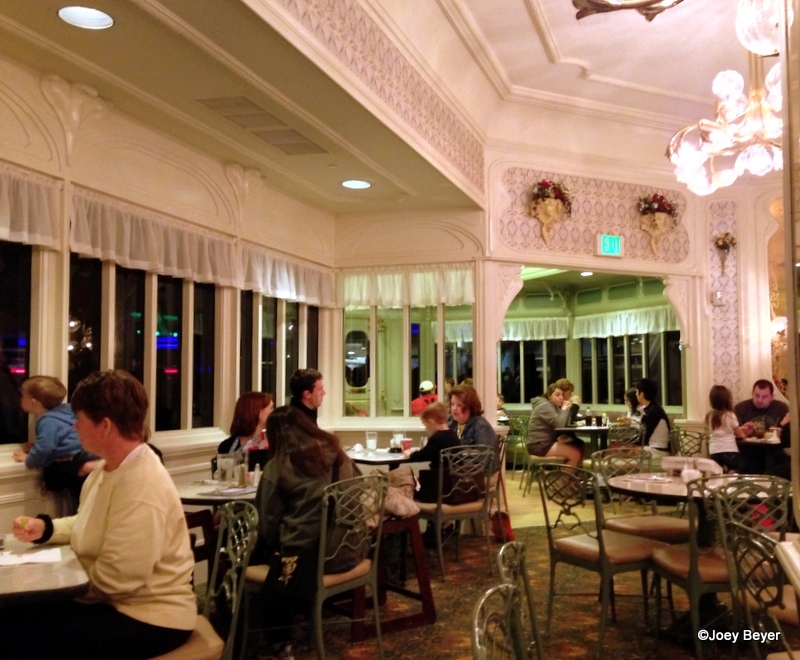 I would not put this on a list of places to go to watch a parade or Wishes, but it is neat to catch a brief look at such things if your dining reservation coincides with them. The menu at the plaza is very straightforward and is pretty traditional café fare. That is in no way a drawback, and I think there really is something here for everyone. One thing that I love is the very reasonable prices. They really are comparable to a counter service restaurant, which is nice if you prefer a table service meal but do not want to spend a small fortune. There is not really much of an appetizer list on the menu, and what options are available are subtle — the addition of a soup or a salad to your meal. The other thing I want to point out about the menu is the shakes and desserts. This is noteworthy because they come from right next door, which is the Plaza Ice Cream Parlor! Thanks to a tip off from AJ, I knew that the shakes were not to be missed. This really ended up being an appetizer for me since it arrived right away. Now, I am sure all of you are much more disciplined than me, but there was no way I was going to resist the shake until my food came. 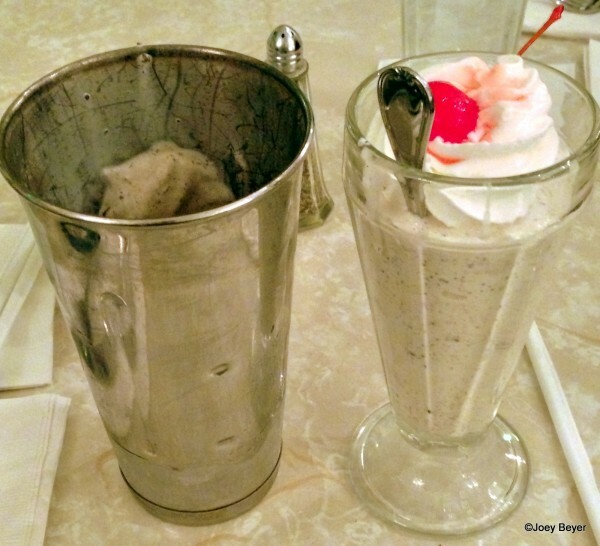 I went for the Cookies and Cream Shake, and in true old school ice cream parlor fashion it came in the traditional glass along with the extra shake in the metal mixing cup. I have had many shakes in my day, and this one is right at the top of the list. When it comes to creaminess, these shakes mean business. The cookies were also adequately crushed, which made for a pleasant consistency. For the main course, I went with the Chicken Strawberry Salad. While I love salad, I do not typically get it as my main meal because I worry about it not being as satiating as other options. However, this salad stuck out to me from the moment I first read it on the menu prior to my trip. 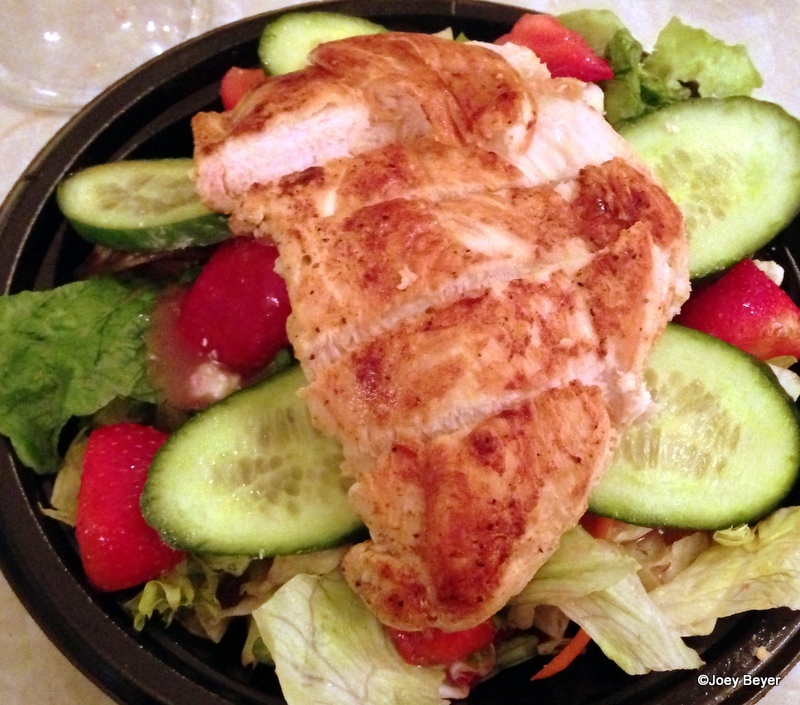 The salad comes with a hearty helping of chicken. In fact, the chicken, strawberries, and other accoutrements almost outnumbered the actual lettuce in the salad. The chicken was tender and well prepared. There is no particular seasoning or flavor that I could pick out, but I thought that was a good thing since this dish has a lot of other flavors at work. 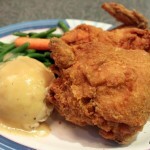 The chicken provided a great complimentary texture, and of course protein. The strawberries were nice and fresh, also. I really enjoyed the dressing, but I rarely dislike vinaigrette. It is worth noting that it is a bit on the tart side, so I would recommend trying it first if tart is not your thing. The salad comes with the dressing already on it, so be sure to request it on the side if you prefer to distribute the dressing yourself. My dining companion went with the Plaza Club sandwich. 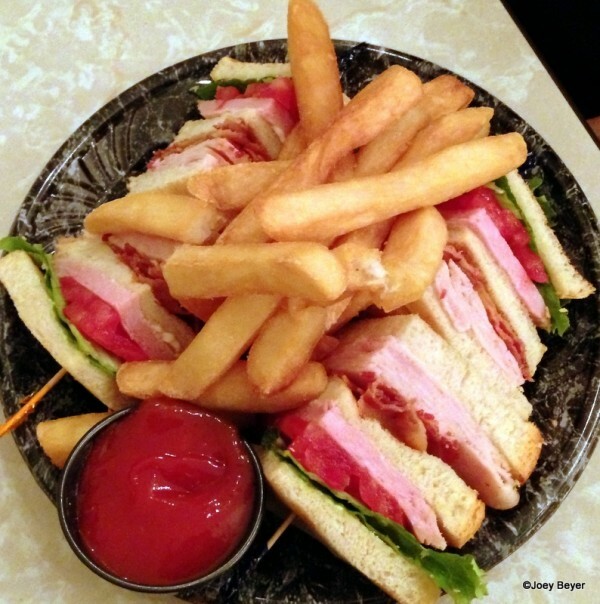 This is not your run of the mill deli meat club sandwich. The Plaza Club comes with thick pieces of ham and turkey breast like you expect at Thanksgiving or Christmas. I did taste the sandwich and it was delicious. The meat was not at all dry, and the bacon adds some nice contrast in texture and flavor. In addition to that, the tomatoes were very robust. While I was by no means famished after the main course, I knew I would be remiss in my duties as a reviewer if I did not sample dessert. Upon seeing a Brownie Sundae served at another table, there was no longer a decision to be made. 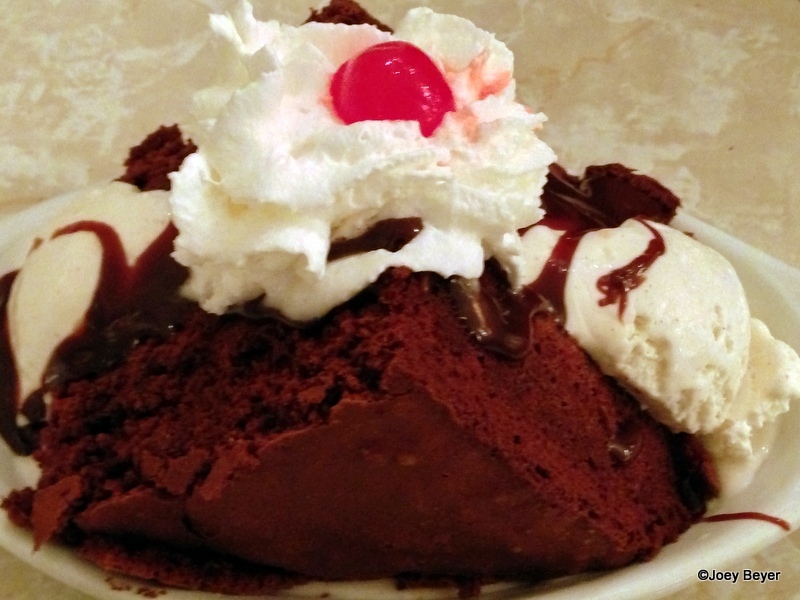 This brownie sundae is substantial, and is perfect for sharing. As I find with most Disney brownies it was a bit on the dry side, but it did not bother me all that much with the ice cream along with it. I really enjoyed this dessert and would definitely order it again. 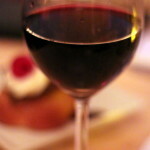 It provided a perfect end to the meal. I had been waiting a long time to try the Plaza, and it definitely did not disappoint. 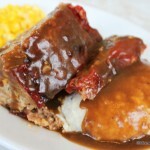 It is a great option for lunch or dinner, and is a great value. 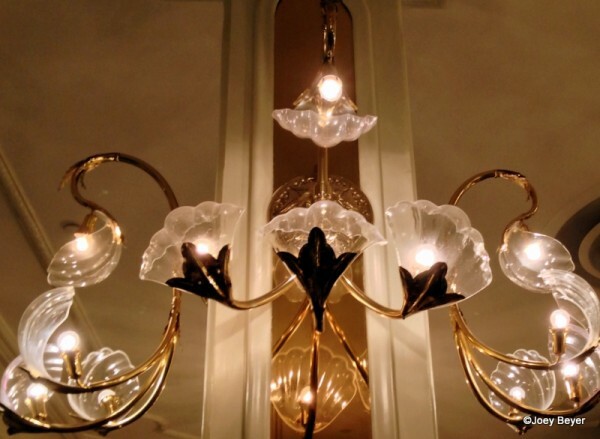 It also offers an enchanting atmosphere with fantastic décor. I did not experience this during my visit, but the citizens of Main St. have been known to make appearances at The Plaza Restaurant, also! 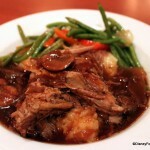 While the menu may not be the most adventurous on property, it is certainly delicious. Joey Beyer is a full time medical student in Illinois, and an avid fan of all things Disney and food related. His first visit to Walt Disney World was at the age of two, and he hopes to eventually move to central Florida to be closer to the magic. Have you been to The Plaza? Share your experiences, comments, and questions below! « From Coffee to Margaritas: The Transformation of Disney World’s BoardWalk Joe’s! Great review, Joey! 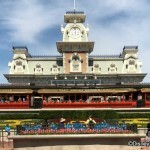 Thank you for sharing, looks like we will have to make sure we stop by on our next trip to WDW!! I could really go for that wonderful Chicken Strawberry Salad right now, with a Brownie Sundae chaser of course. Yum! What!!! Is that black plastic-ware under the food? When did THAT happen? Hopefully this is just a temporary thing while the Main Street Bakery is being converted. Please don’t tell me that a plastic spork came with the meal. Argh. This location always confuses me so I’ve never eaten there. Is it a cross between table and counter service? I can’t wait to eat there on our next trip. I’ve been wanting to try it for years and I’ve finally talked the rest of my crew into it!!!! Thanks so much for this review! We are heading to MK in about 4 weeks. A few days ago I booked reservations at The Plaza and this is such a nice preview of what to expect! Like the other commenter…I hope the food isn’t served on disposable dishware…I hate the waste aspect of that! Anyway, that salad also stood out to me from the menu. I can’t wait to try a shake! When I first heard about the plaza last year I knew that i wanted to try that brownie sundae!!!!! It looks soooo good! I haven’t gotten a chance to try it yet though :(. As for the dryness of the disney brownies I would probably agree with that in most cases (The exception to this is the brownie sandwhich at Earl of sandwich. That brownie is AMAZING!!!!). However since this comes with ice cream im sure that would cancel out the dryness. I love brownies and ice cream and 9/10 times if a brownie is kind of dry the ice cream helps. Never been drawn to this place. It seems like a waste of a table service credit. I mean, the sandwiches might be great and the cost great for those paying out of pocket, but Liberty Tree Tavern seems like better value for someone on the dining plan. Thanks for all the positive comments so far everyone! I am glad so many people are heading there and I could provide some good information. Jenny – The brownie definitely is made much better by the ice cream being there. I agree with you completely. Janel – I cannot speak for AJ, but I would be hesitant to spend a TS credit here too since, as you pointed out, it is an awesome out of pocket value but is not the best use of a DDP credit in terms of value. If you ever end up going there someday be sure to let us know what you think! Thank you for explaining the plasticware. I don’t know if its the closeness of the picture but the salad looks small to cost $14.99. It’s sad to hear the brownie sundae was dry. The brownies at the Main Street Bakery were the best on property. They were my daughters favorite brownies. Hopefully the Main St. brownies will be just as good as you and your daughter remember them when the new location reopens! If not, I am sure they will have those same brownies offered somewhere in the parks. Great review. I haven’t eaten here yet but am thinking of trying on my next trip. We tried the Plaza on our first Disney trip because one of the guidebooks touted it as having the best ice cream sundae in Disney World. We were pleasantly surprised by the quality of the food. It is very simple, but delicious. We have returned there several times, and we plan to eat there again on our next trip in June. My BDFF (Best Disney Friend Forever) always eats here just before her family leaves the park on their last day of their vacation. She is the opposite of me when it comes to what she’ll eat. Essentially an anti-foodie. The simple fare here is very comforting to her. I agree. It’s hardly high cuisine, but everyone will find something they’ll eat at the Plaza. JoAnn – Thank you so much for the kind words. Be sure to let us know what you think when you go! Cindy – I’m glad to hear it is one of your favorites! I definitely cannot wait to go back. Galloping Gourmand – Very true! Sometimes even us foodies just want something more simple but still high quality, and The Plaza is always perfect for that. Plus the reasonable price makes it less devastating should you happen to dislike a particular dish. 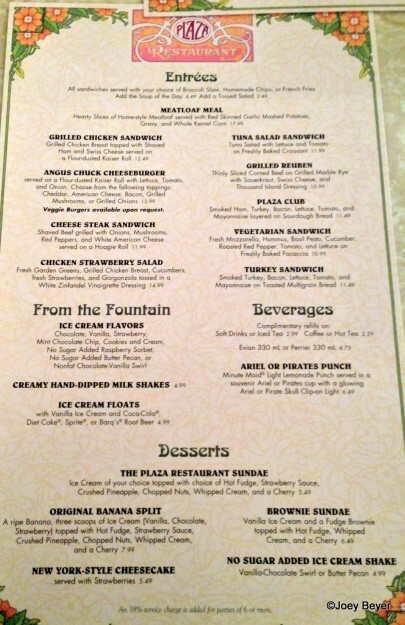 The Plaza was one of my Mom’s favorite restaurants at Disney. She was a sucker for a good malt or milkshake. I dragged my parents to Disney in 1997 and they fell in love with the place. One of the first places we ate at was the Plaza. The food is good, not great, but I love the atmosphere and how well the restaurant fits in on Main Street. Every trip I have ever taken to DisneyWorld has included a stop at the Plaza and I am sure on my next trip I will eat at the Plaza and raise a milkshake in honor of Mom. We’ve eaten there a few times. As you wrote good prices and decent sandwiches, burgers and salads. We thought the location and the ice creams were the better parts. It’s not a must dine kind of place but one definitely to consider especially in the magic kingdom. My wife and I thought the plaza was ok; had better and worse at the magic kingdom. The service was poor though. On the bright side, the mayor of Main Street came in during lunch and made a boy who was celebrating his birthday his deputy for the day. That was cool. Beth – What a great way to honor your mom and remember some great times together. 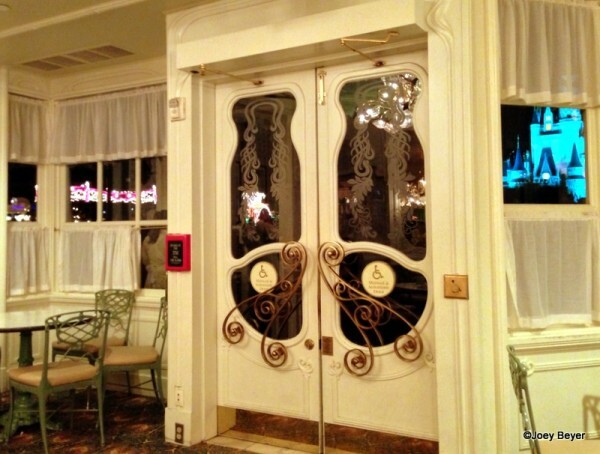 Pardonmyfrench – I totally agree, especially since most other MK options are pricey and/or character meals. This is nice if you just want a quality meal and some time to relax and enjoy some good company. Colm – I am sorry to hear the service was bad! Our server was ok. He definitely made the meal feel a bit rushed, but on the other hand it meant we got everything very fast. It wouldn’t stop me from going back, but I definitely would hope to get a different waiter. Thanks for all these great comments so far everyone! This is my mom’s favorite restaurant, and one of my top because of the Reuben! One of the few places that serves this sandwich, and this one is great! We have had dinner there a couple of times. It was one of our favorite places on our last trip.We love how you step in there and be so far away from the noise and yet still see the castle. Very good food and nice service. We have had many meals here and have all been great. We ate there in 2010 and loved it. We happened to be the 100th guest and at the time there was a lady dressed in Victorian attire that walked around. She came over, announced our family as #100 of the day, played a sticker game with my twins, took pics with us and we got a dessert for free. The food was good and plentiful. We will go back for sure.